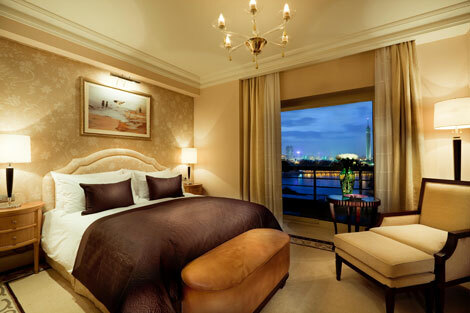 Luxury hotel group Kempinski has unveiled its second property in Egypt, a 191-room hotel overlooking the banks of the River Nile. The Kempinski Nile Hotel Garden City Cairo has been designed by French arhitect Pierre Yves Rochon (responsible for the interiors at the soon-to-reopen Four Seasons and The Savoy in London), and features 54 suites with pricate balconies. There are four restaurants including French eatery Floor 10 and The Blue Restaurant and Grill, and a further four bars including Shishaway (which as the name would suggest offers guests shisha pipes), as well as a spa and health club with steam room, sauna and spa bath. Opening rates at the hotel start from €200 per night including breakfast, valid for stays until the end of September. The Cairo property joins the Kempinski Hotel Soma Bay (located on the Red Sea close to Hurghada International airport) as Egypt’s second Kempinski-branded hotel. For more information visit kempinski.com/cairo.